An additional 493 Qualfon contact center managers and supervisors have earned their Six Sigma Green Belt certification through Keisen Consulting and Qualfon’s Leadership Academy. The achievement marks another step forward in Qualfon’s effort to certify every supervisor in Six Sigma practices. Qualfon, a mission-driven business process outsourcing (BPO) company and global provider of contact center services, reported today that during 2016 an additional 493 contact center managers and supervisors have earned their Six Sigma Green Belt certification through Keisen Consulting and Qualfon’s Leadership Academy. The achievement marks another step forward in Qualfon’s effort to certify every supervisor in Six Sigma practices. Since the start of the initiative, the total number of certified leaders has now risen to a total of 812. Qualfon’s Leadership Academy is a company-wide initiative that requires contact center supervisors, managers, and leaders to complete 19 management courses and attain Six Sigma Green Belt certification through an independent certification company. Qualfon partners with Keisen Consulting in Mexico City to support education and certify employees in Six Sigma practices. “Six Sigma is the gold standard for process improvement in the contact center industry. We’re very proud of these individuals, whose accomplishments reflect highly on our management team. Clients who choose Qualfon get a partner who actively invests in the development of front-line management, bringing leadership closer to the point of service,” said Mike Marrow, CEO, Qualfon. With help from Keisen, Qualfon customized an accredited curriculum, called “Continuous Improvement & Six Sigma Green Belt Certification” or CI6S, which paves the way toward Green Belt certification. The program continues to evolve, empowering supervisors to quickly put newfound skills into practice in the contact center environment. “Our project-based learning processes were implemented in a pilot program earlier this year, and they provided a great ROI with direct improvements in key performance metrics at our sites in the Philippines. The project-based learning made such an impact that we’re working toward making this approach a more advanced curriculum for the future,” explained Barrenechea. 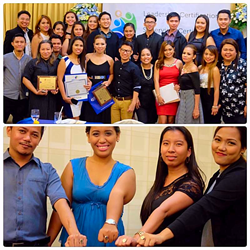 Qualfon’s Green Belt supervisors span the globe across the Philippines, Guyana, Mexico, and the U.S., and Qualfon expects its total number of certified leaders to continue to increase twice each year, when the certification course is offered. “The Leadership Academy and Six Sigma certification programs are where personal development intersects with operational performance, so these investments are critical when rising to standards of excellence. This is right where Qualfon is making significant commitments,” said Barrenechea. Qualfon is a mission-driven business process outsourcing (BPO) company and a global provider of contact center services and back-office processing. With experienced BPO leadership and a strong track record of business growth dating back to our founding in 1995, Qualfon helps companies reduce costs and deliver superior customer experiences. Today, we have approximately 12,000 employees serving international brands across many industries, and our intelligent outsourcing locations span the United States, the Philippines, Guyana S.A., and Mexico. Qualfon’s mission to “Be the Best BPO, Make People’s Lives Better” means we invest in our people and, in return, they take better care of you and your customers. Qualfon’s employee retention regularly exceeds the industry average, which creates a people-driven value chain: Our employees stay longer, providing you a higher quality service at a lower price.